Wai'ao (Outer Harbor) of Toucheng, Yilan is located to the north of Wushih Fishery Harbor. 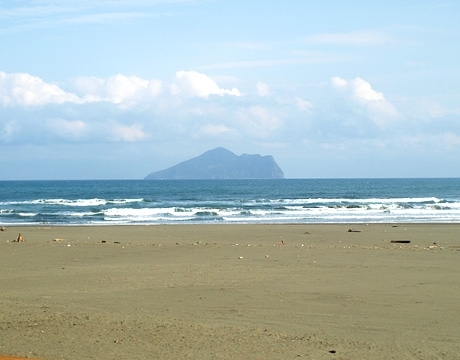 It is a flat expanse of beach, with great views such as snowy white waves gradually climbing the shore while glittering under the sunlight and the vague shadow of Turtle Island in the distance. What a sight! 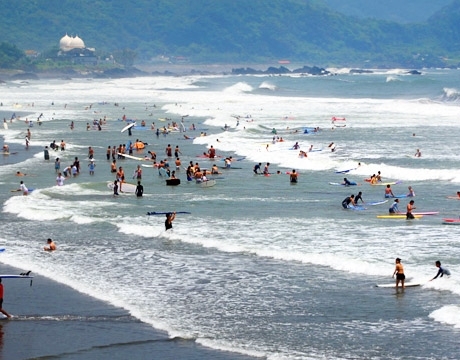 Besides playing with the waves, this area provides extreme sports that combine excitement, technique, and difficulty, such as paragliding, surfing, and other activities that require courage! Of course, easier choices such as dune buggies will allow tourists to travel all around Wai'ao’s beaches in a 3-dimensional exploratory trip totally up to themselves! As the night falls, tourists will also be able to choose from quality B&Bs and pass the night listening to the waves! Recently, the Wushih Fishery Harbor Ocean Fishery Harbor Project currently in progress has completed the breakwater and pier. Former sites of interest have been drawn up as a memorial park, and with the rise of whale watching activities, the harbor has become an excellent place to go to during vacations. For the convenience of tourists, a Tourist Service Center has also been established. The north side of dike paths have also become a great place for taking a stroll in the dusk light or finding a good view of Turtle Island.